In this op-ed by Nyle DiMarco, as told to Bobby Siebert, Nyle opens up about having to leave Black Panther, and the captioning systems that fail deaf people. Last weekend, I set foot in a movie theater for the first time in five years. It was a worthwhile occasion: like more than half of America, I was itching to see Black Panther and its groundbreaking majority-black cast celebrating diversity on the big screen in a major blockbuster, led by Ryan Coogler. After receiving my ticket at the box office, I typed in my phone and showed the screen to the ticket salesperson: "I am deaf, do you have a device for me?" Moments later the salesperson emerged holding a black device called CaptiView. It had a circular base, a long spindly arm (not unlike one of Doctor Octopus' mechanical arms), and a rectangular head. In my seat, I stuffed the circular base into the cupholder and grappled with the Doc Ock arm until I could see the little green letters inside the rectangular head. I could feel eyes darting towards me and the black box dangling in front of my face. The rectangular head started to dip sideways, too heavy for the Doc Ock arm. I tried to lift it back up, but the arm wouldn't keep upright. I had to slink into my seat so I could see the green letters again. By this time the lights had dimmed and we were minutes into Black Panther; I'd missed the introduction. The captions worked fine for a while, and then I noticed something odd. The dialogue wasn't quite making sense. I studied the actors' mouths on screen and realized the device was lagging and skipping lines. Making matters worse, I noticed there were subtitles on the screen when the Wakandans spoke in their language. But my device was blocking the bottom portion of the screen and I had to lift myself up in my seat to see the foreign-language subtitles, and then quickly return to my slouch to catch the English dialogue on the CaptiView. Before long I had a major headache from my eyes refocusing constantly from the device inches from my face to the screen fifty feet away. The device was a nuisance to use, embarrassing to have parked in front of my seat in a movie theater, and infuriatingly undependable. But it was the only way the theater offered for me, and millions other viewers like me, to access the movie. 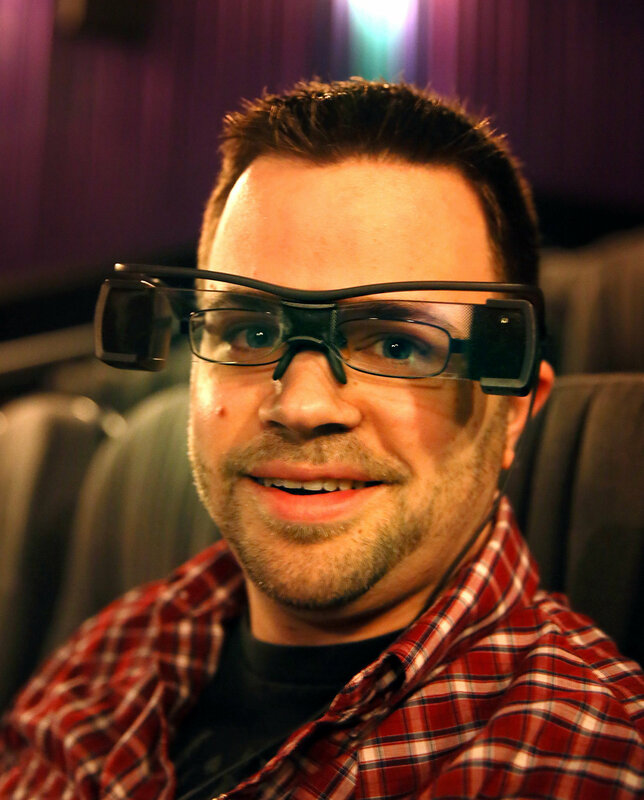 In other movie theaters, there are alternative devices, like these glasses, which are no easier to use, nor do they display captions more reliably. It was a frustrating reminder why I had not gone to a movie theater in so long. Back when I was growing up, some movie theaters would offer open captions. This meant the captions were right there on the screen. Though these open captioned showtimes were limited to selected days and times, when they did happen the experience was much more accessible and enjoyable. Some time ago movie theaters made the switch to these new captioning devices, and soon after that I stopped going. As a deaf person, captions allow me to enjoy TV, movies, and entertainment. But myself and the 360 million other deaf people in the world aren't the only ones who benefit from captions. Captions can help movie viewing experiences for people with ADHD, learning disabilities, and autism. It makes it easier for new language learners to understand dialogue. It also comes in handy in a ton of movie situations. When an actor mumbles, speaks in a heavy British accent, or is trying to make himself heard amidst a Michael Bay movie explosion scene, captions are there to make the dialogue crystal clear. Unreliable captioning, or the lack thereof, isn't just a problem in movie theaters. Only a fraction of in-flight movies and TV shows have subtitles. Even though it's just a few remote clicks away, a ton of TVs in public spaces don't have the captioning turned on. The Internet brings a huge amount of filmed content to our screens, but so little of it is captioned. Recently, I tuned in to CNN’s Facebook page to watch the live-streamed town hall that Senator Marco Rubio hosted after the Parkland school shooting. I wanted to watch the essential dialogue between the students and members of the community so impacted by the tragedy and the Senator. But I couldn’t. It wasn’t captioned. I’ve heard the standard counterargument. Onscreen captions degrade from the viewing experience. They’re annoying and distracting. I call BS. People don’t mind subtitles when they don’t understand the language being spoken. Captioning enhances the viewing experience. It should be a standard part of any filmed media — not as an afterthought, but as a part of the ultimate golden standard of universal design. There's tons of room to improve and we have to be vigilant, or what progress that has been made will be lost. Take the Americans with Disabilities Act. It's a landmark legislation that made many things possible for deaf people like me and the more than 55 million other people with disabilities. It's also a major reason why a lot of filmed content has any captioning at all. Just this week the House of Representatives passed a bill, HR620, that weakens the ADA. If it also passes the Senate, many of these hard-won civil rights could be dramatically reduced. Ten minutes into Black Panther, I couldn't take it anymore. I had missed half the dialogue in the movie at that point and had a nagging headache. I walked out. When I explained my experience to the manager, they apologized and gave me two free tickets. For me to relive the indignity, perhaps. I threw the tickets away. I'll wait until Black Panther is out on Blu-Ray.